Dennis had another birthday. 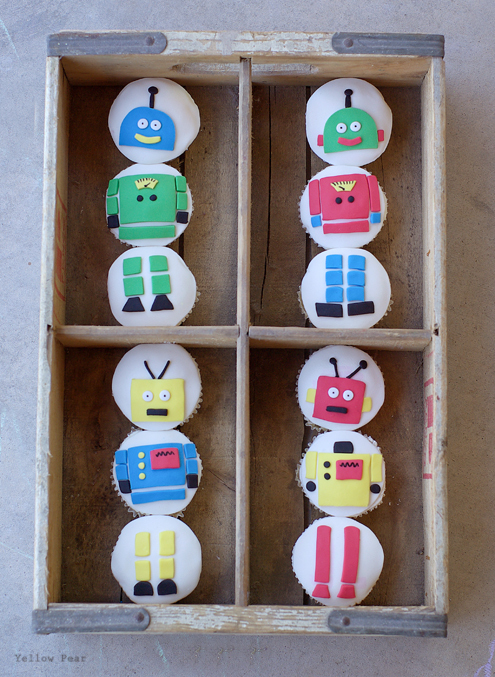 We went with a robot theme. 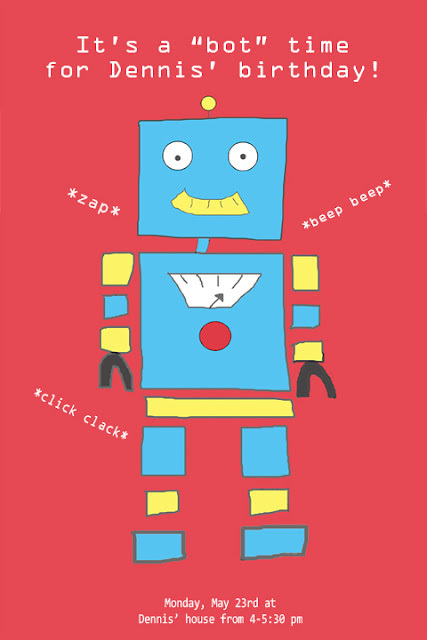 He helped me draw some robots in Photoshop and I used one of them for his invite. And I could not for the life of me think of what sounds a robot makes, other than "beep beep". So I googled it and found some ideas. That Google knows everything. 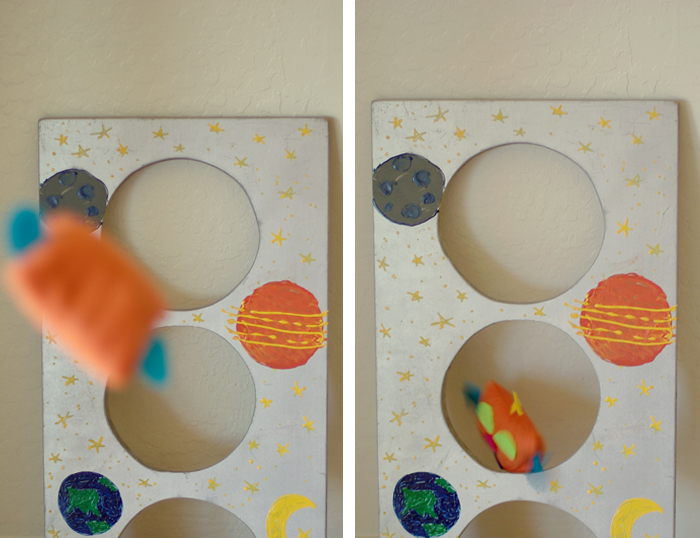 When guests arrived, they played with a beanbag toss. 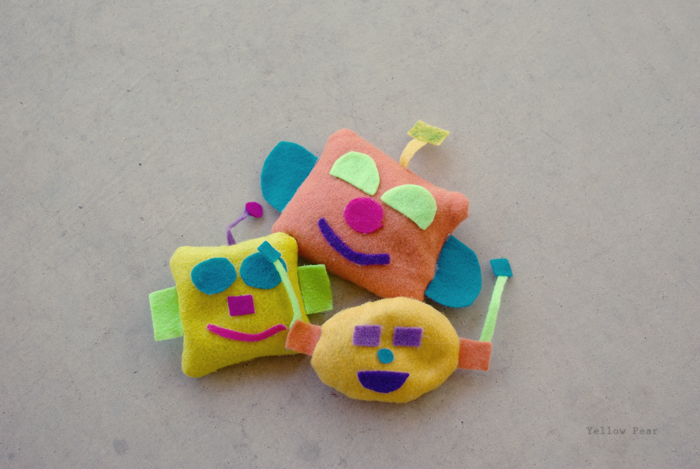 Miss B and her buddy made the robot-head beanbags for me (they're not quite within the color scheme, but that's what was on hand in the way of felt colors...and I like to use what I have.) I borrowed the actual wooden game part...whatever it's called. 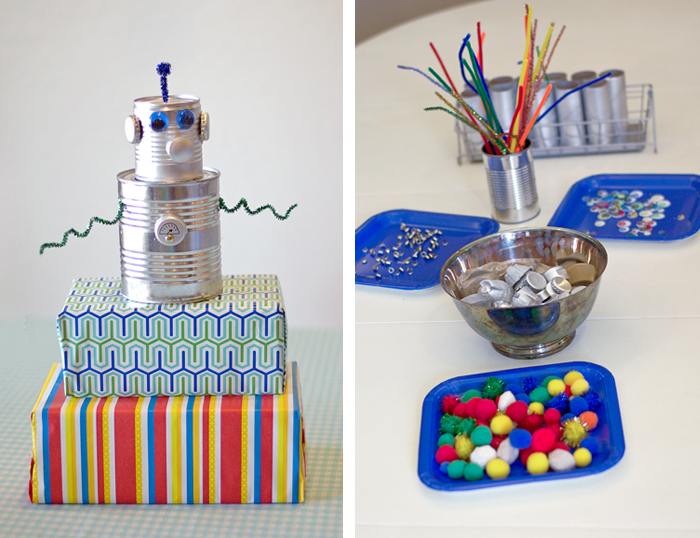 For the main activity, each boy got to make their very own, completely one-of-a-kind robot. I saved different sized tin cans for months. I also gathered all kinds of doo dads and whatnots, like toilet paper rolls, bottle caps, various lids, egg cartons, etc. and spray painted them all silver. 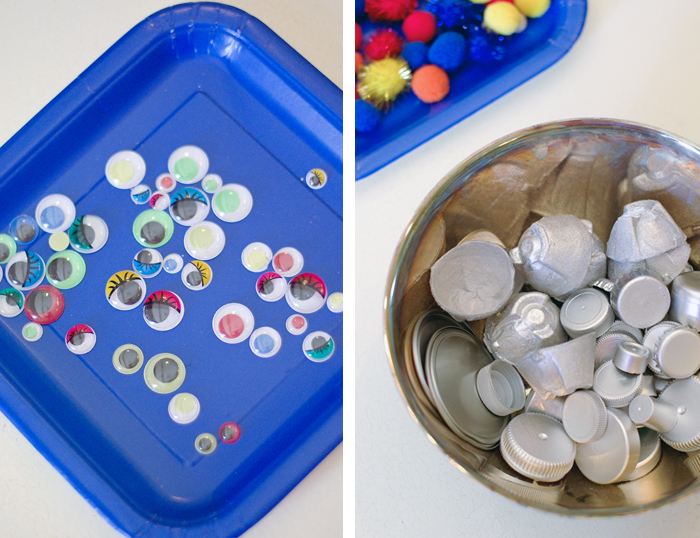 Miss B added some grommets and brads that she found from my craft stash and I bought some colorful pom poms, pipe cleaners and googly eyes for decorating. Miss B and I made a model for them to get inspiration from and they set right to work. 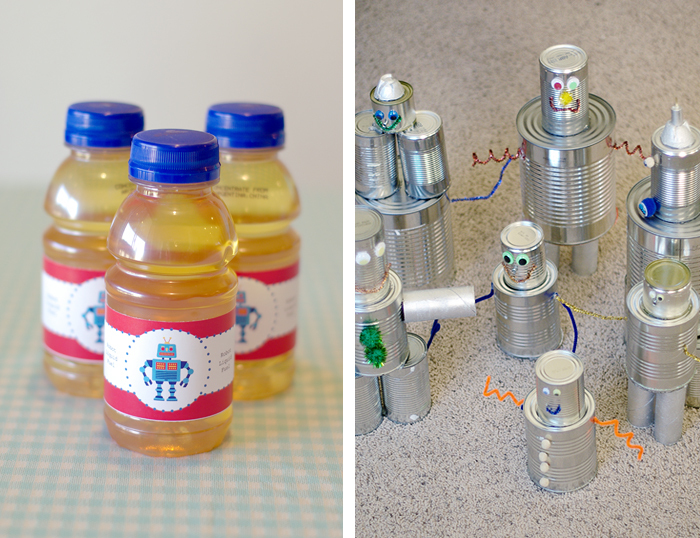 Here we have Robot Liquid Fuel (apple juice) and the finished robots. The one in the top left has a brain installed even. 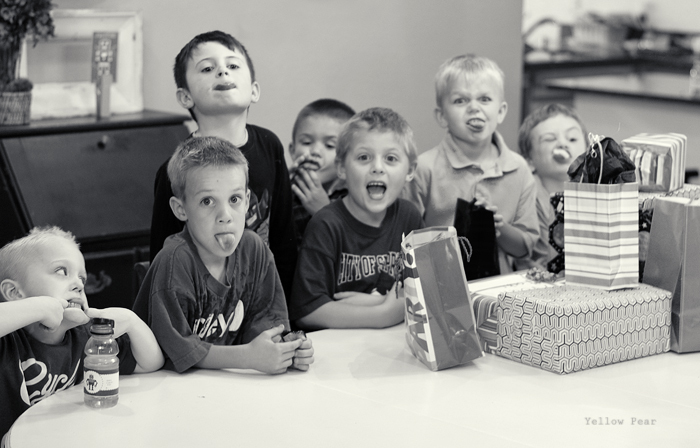 Little boys are funny. And loud. I won a dozen cupcakes awhile back and after much deliberation, I decided what I wanted. 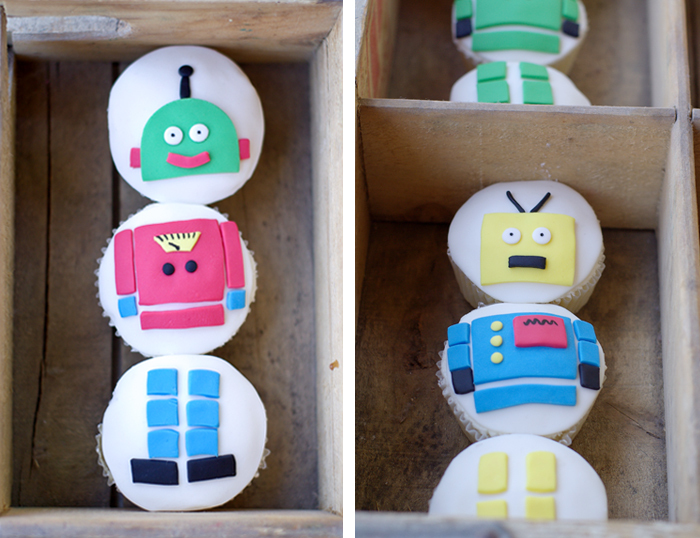 I had seen some mix-and-match robot cupcakes and about died, they were so perfect. I emailed Katie from Katie's Cakes and she handled the rest. When I picked them up I was absolutely giddy because they were stunning and beautiful and perfection and so cute and wonderful and all things glorious. They were so wondrous in fact, that we baked our own cupcakes for the party guests and saved the fancy ones for our own family. Is that mean? Oh well. I couldn't bear to part with the decadent lemon cupcakes with raspberry filling and butter cream frosting (I picked the flavors). I feel a little guilty, but not much. They were very too yummy. Plus kids only usually eat half of their cupcakes or just lick the frosting off, so I think it worked out right in the end. 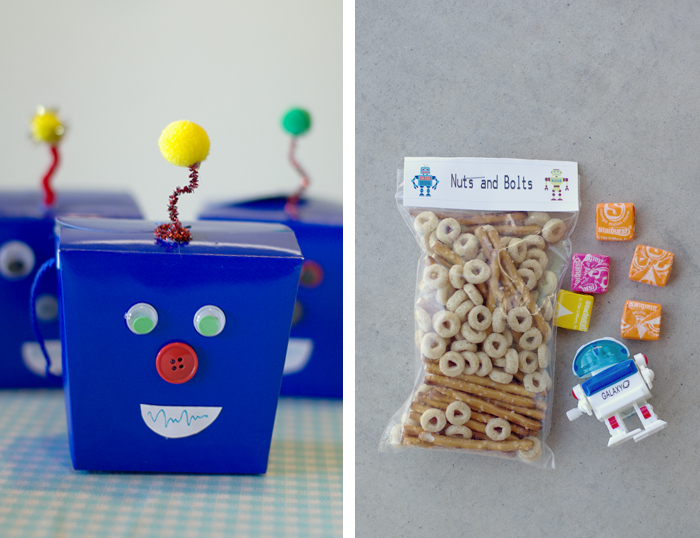 Miss B decorated favor boxes to look like robots and we filled them with starbursts, a bag of "Nuts and Bolts" and a wind up robot. 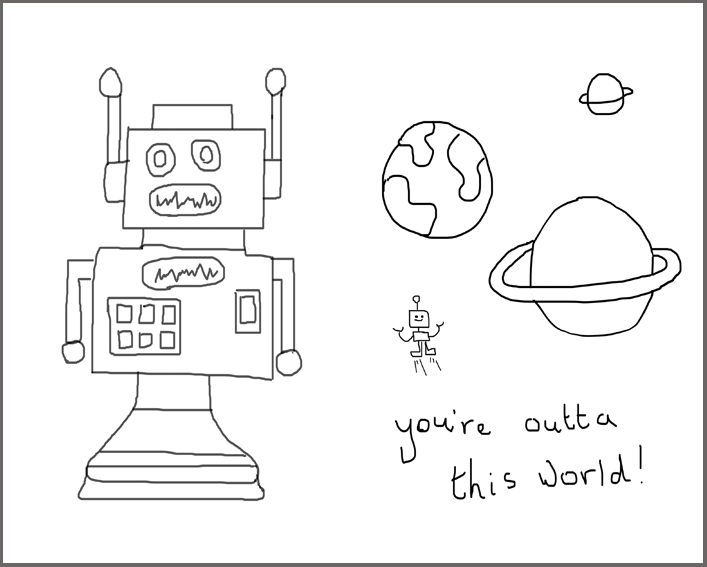 We also made some coloring pages from the robots Dennis made. I helped and Miss B contributed a couple too. 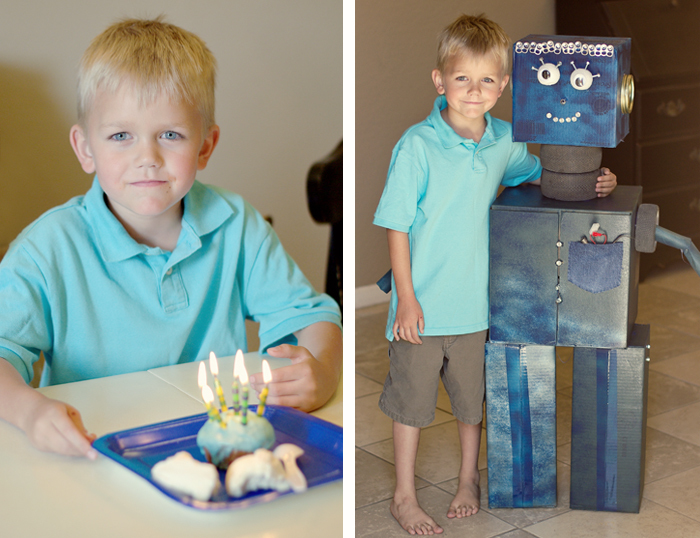 I'll leave you with a shot of the birthday boy with his cupcake (the ones we made for his party, not the cool ones) and the giant robot that a great and talented friend made and brought over because she loves me. Isn't it the coolest? I love the eyelashes made of screws and the pocket of spare parts! And now I need to go reclaim my life as this post has taken ages and AGES to put together. Not to mention I still haven't completely cleaned up from the party. Farewell. Oh, Lou, I just swoon when I read your posts. SWOON! 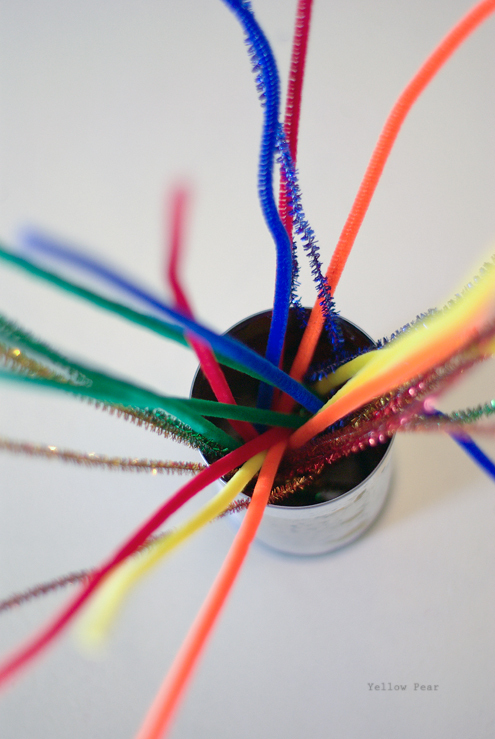 The planning, the forethought, the gathering, the effort, execution, cutting, gluing, spray-painting, organizing, etc.! Gad-freakin-ZOOKS, girl! Can I rewind the clock and have YOU for my mom?? AWH I love it. 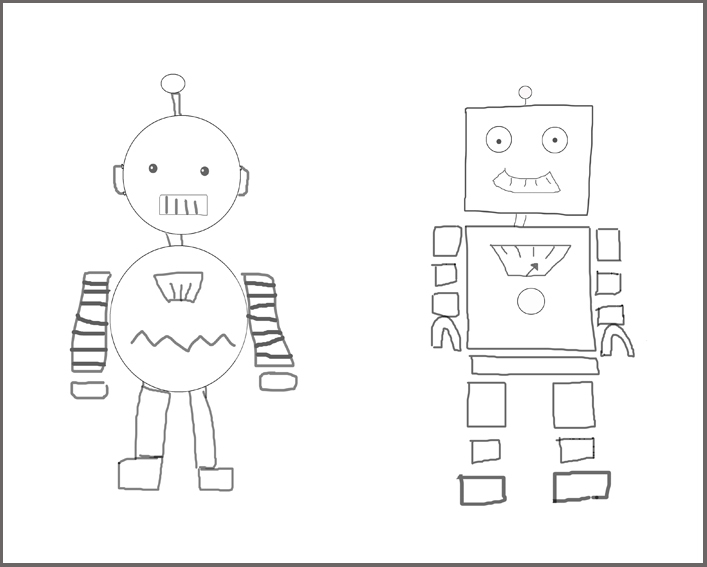 Can you send all of that stuff over this way so I can copy you without having to do the work and have a robot party for Rainier? So cool. I love it. You are such a great Mom. you're amazing! i love it! Happy Birthday, Dennis! Cute as always! 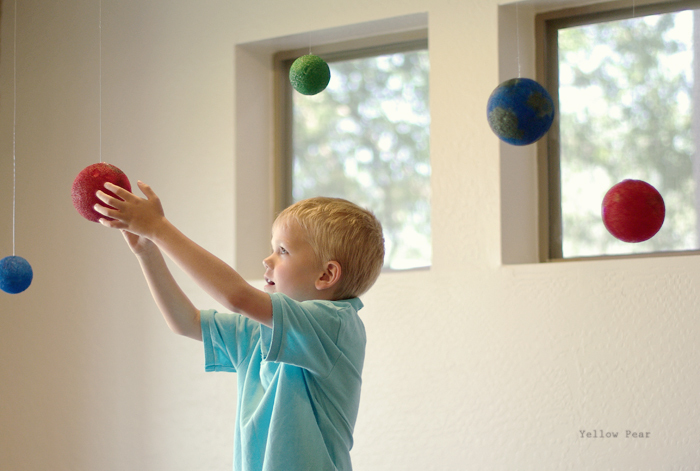 Lucky, lucky kids.